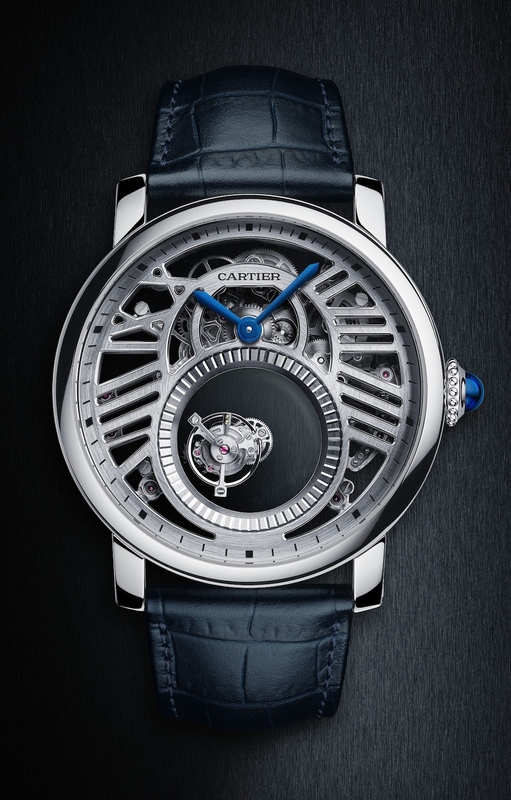 The Mysterious Double Tourbillon movement created at the La Chaux-de- Fonds Manufacture in 2013 represents a milestone in Cartier watchmaking history: the tourbillon appears to be suspended in mid-air with no connection to the rest of the movement. As a double fying tourbillon, it effects a complete rotation in 60 seconds, while the tourbillon cage performs a second rotation in which each round takes 5 minutes. This balancing act is all the more formidable in view of the finely constructed case and painstaking craftsmanship. All of the components are hand-fnished: the bridges chamfered, fanks drawn and screw heads polished. This year’s addition of skeletonised bridges in the shape of Roman numerals enhances the lightness and power of the watch. The magic of the mysterious is encased in the transparency of the skeleton. The curves of the watch and mysterious movement are complemented by the stark geometric openwork architecture of the skeletonised bridges.